The Front Runner – From 4x Oscar nominated writer / director Jason Reitman, starring Oscar nominee and Golden Globe winner Hugh Jackman! 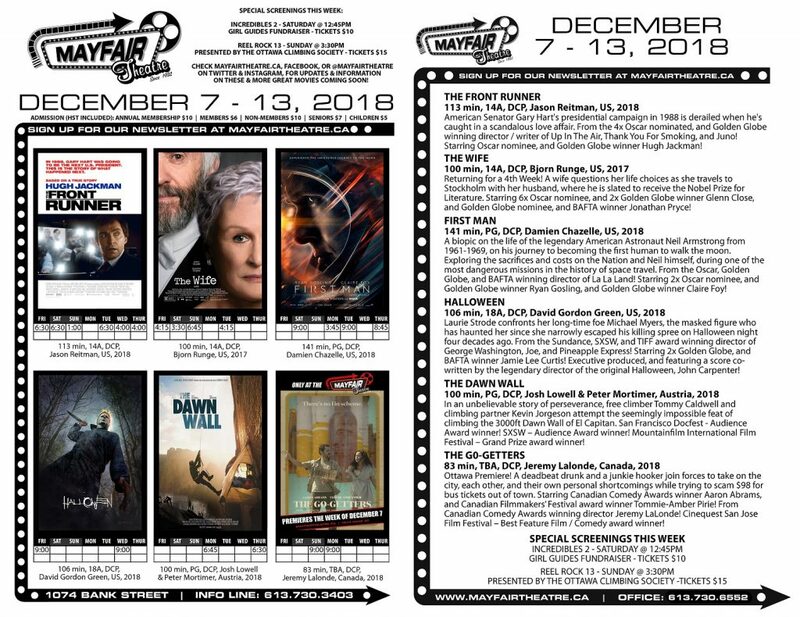 The Wife – Returns for a 4th Week! Starring 6x Oscar nominee, and 2x Golden Globe winner Glenn Close, and Golden Globe nominee, and BAFTA winner Jonathan Pryce! First Man – From the Oscar, Golden Globe, and BAFTA winning director of La La Land! Starring 2x Oscar nominee, and Golden Globe winner Ryan Gosling, and Golden Globe winner Claire Foy! Halloween – From the Sundance, SXSW, and TIFF award winning director David Gordon Green! Starring 2x Golden Globe, and BAFTA winner Jamie Lee Curtis! Executive produced, and featuring a score co-written by the legendary director of the original Halloween, John Carpenter! The Dawn Wall – San Francisco Docfest – Audience Award winner, SXSW – Audience Award winner, and Mountainfilm International Film Festival – Grand Prize award winner! The Go-Getters – Ottawa Premiere! Starring Canadian Comedy Awards winner Aaron Abrams, and Canadian Filmmakers’ Festival award winner Tommie-Amber Pirie! From Canadian Comedy Awards winning director Jeremy LaLonde! Plus, special screenings of Incredibles 2, and Reel Rock 13!